Should I Paint my Vinyl Siding? We are product to offer Vinyl Renu to the general public. For years, it was only available to siding manufacturers and professionals. NOW, FOR ABOUT 14 CENTS PER SQUARE FOOT YOU CAN RESTORE THE COLOR OF YOUR FADED VINYL SIDING. Watch how easy it is to bring back amazing color to your faded vinyl siding. The videos will show you how to restore faded vinyl siding. 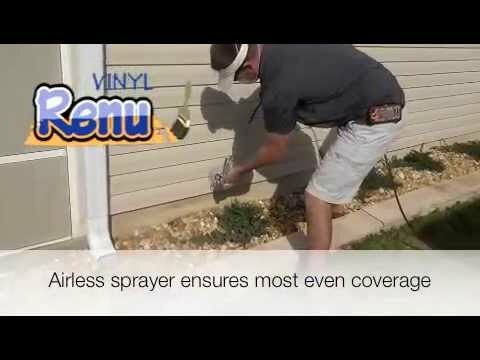 Vinyl Renu can also be used on faded aluminum, cement board, painted siding and many other weathered outdoor surfaces. YOUR SIDING WILL LOOK BEAUTIFUL FOR UP TO A DECADE. Vinyl Renu was developed as the best product to restore faded vinyl siding. We spared no expense in the development of it. As a result, no other product can compare. We have built in extreme UV protection. Its like rubbing SPF 60 all over your home. Except, Vinyl Renu will last much, much longer. Vinyl Renu uses marine, aerospace and automotive high end chemistries to protect your home or property. So watch the videos and learn the easy way how to restore faded vinyl siding. Watching these videos will show you how to restore faded vinyl siding. Your faded vinyl siding can look beautiful again for about 34 CENTS per square foot using Vinyl Renu. The above videos demonstrate how easy it is to restore faded vinyl siding. Almost anyone can do it. INCREASE THE CURB APPEAL OF YOUR HOME. BUY VINYL RENU NOW!!!!!!!!!! !